Google has released a new Google Image Search. Ever true to their aim of providing the best possible user experience, the new Google Images is a lot quicker and more intuitive to use. If you are looking for photos or graphics, the new image search interface is great. Well, in terms of reach, Google Image Search is responsive, which makes it convenient to use on any device. With the rapid growth of Internet use on touch and mobile devices, this means more exposure for marketing purposes. In terms of traffic, something interesting is happening. Analytics programs are now reporting a great reduction in referrals from Google Image Search, which has some folks freaking out. But in the previous version of Google Image Search, clicking an image from the search results loaded the corresponding site in the background as a visual reference, which wasn’t a real visit. Since the last update, visits to the website from Google Image Search are all real. 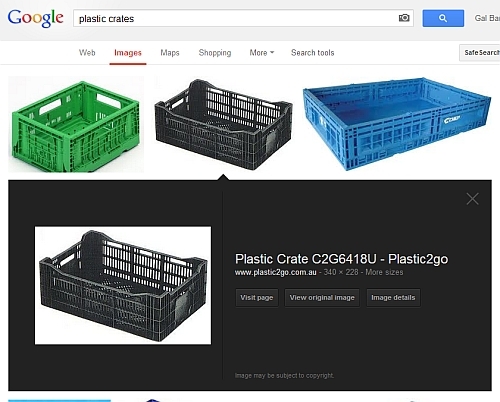 Comparing image searches I’ve done in the past for “plastic crates”, it seems the variety has increased and Google now looks for similar images, rather than displaying clusters of images from the same site. This is not good news for sites with many related images, but it is good news for sites with fewer images. In effect, small business sites are likely to benefit from this change, while large professional sites may lose some traction. Clicking on the Image Details button brings up a search for similar images, which is also likely to benefit small business sites and put them on par with larger sites. Essentially, if you have good images on your site, they are now more likely than ever to come up in a search, at least a search for images. The bottom line is kinda obvious. Take some quality photos of your products, create some illustrative images for your services and put as many of them as possible on your site. Set their alternative text (ALT) and title attributes to attract search engines and vary the images and the text around them. Google will do the rest. Since Google gives bonus points for fresh content, publishing new images is a good idea. You can do this by adding new products to your catalog, but the best way is to publish regular blog posts with at least one impressive image in them. Thanks Gal – great information and thanks for sharing.